As many French people interested in history and desperate to find old documents in Hong Kong, I ended at Yves Azemar’s Indosiam library. 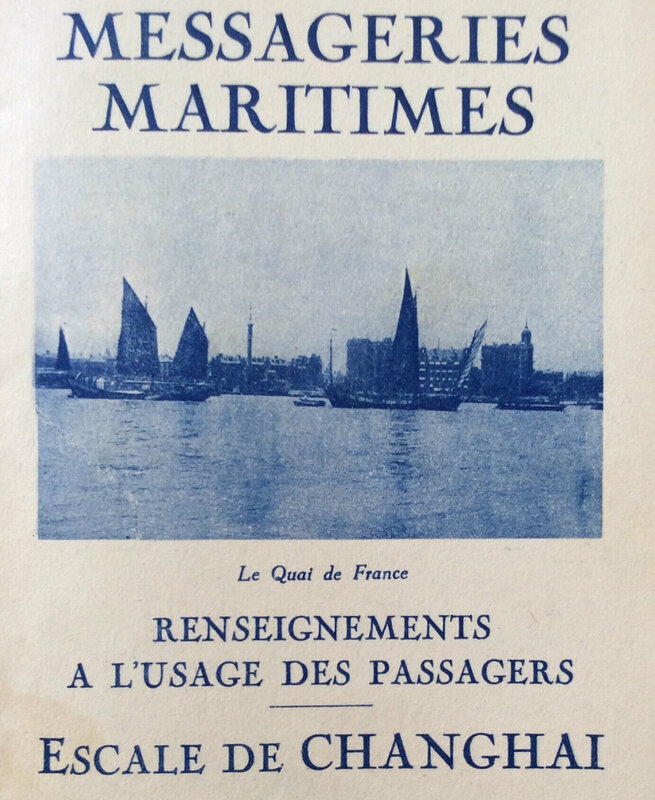 Among the treasures collected by Yves, one particularly caught my attention as related to Shanghai: the 1939 "Changhai" stop guide of the Messageries Maritimes. The Messageries Maritimes started their business in Shanghai in 1862 as a service to the French colonial troops which came to tame the Chinese rebellion. The need for a regular line of military supply, mail service and transportation made the French Empire grant extremely favorable conditions to the Marseilles-based firm, going as far as compensating for its losses. The increasing demand for the passengers services led a few years later to the creation of a luxurious ocean-liners fleet, in addition to existing freight. Passengers became the most profitable line of revenue for the Messageries Maritimes, with existing lines to Algeria and Indochina. Three different classes of tickets were available with absolutely no comparison between them. It was for instance in the most humble class that some 20000 Chinese workers were sent to France during WWI to help on building trenches. The wealthiest passengers, however, would enjoy a full room service and top end French cuisine on the upper deck level. We also know from French historian Guy Brossolet that elite passengers would be separated from “easy” women, if this quality was ever mentioned on their passport as a base rule of the company. No effort would be spared to guaranty tranquility and comfort to high end customers. Pets had to be accompanied at all time and taken care of by the ship helpers. For all these reasons, many wealthy travelers to Asia chose the Messageries Maritimes Ocean Liners, when compared to their Japanese competitors, Nippon Lines. 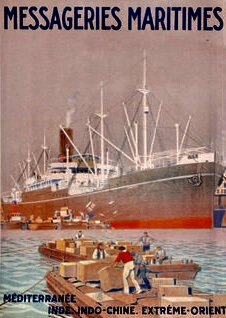 In 1939 in Shanghai, when the leaflet that I bought was issued, Jean Cochet was in charge of the company's destinies. He was a prominent figure in the French Concession, being the President of the Shanghai Chamber of Commerce and the French Club, the notorious Cercle Sportif Français. No need to say that the reputation of the Messageries Maritimes together with the absolute comfort of the passengers was of premium concern to him. Since 1937, however, the Shanghai stop had become a most sensitive one because of the occupation of China and outskirts of Shanghai Foreign Settlements by the Japanese army. More than half of the city was actually under the rule of the Empire of the Sun and the puppet regime of Wang Jingwei, making circulation inside former safe zones like Chabei (Zhabei) or Hunjao (Hongqiao) hardly possible. We find interesting historical clues of this in the Shanghai stop guide which recommends to be accompanied by a well acquainted guide to cross to the North side of the Suzhou River. Adventuring to Kiangouan (Jiangwan), it continues, is banned, making it impossible to admire the recently created Great Changhai Civic Center which has been heavily damaged by the bombings of the battle of Shanghai. Then, the guide recommends the most luxurious venues, including of course the Cercle Sportif Français, close to Avenue Joffre. I guess that Jean Cochet being its president would make this tip inevitable. 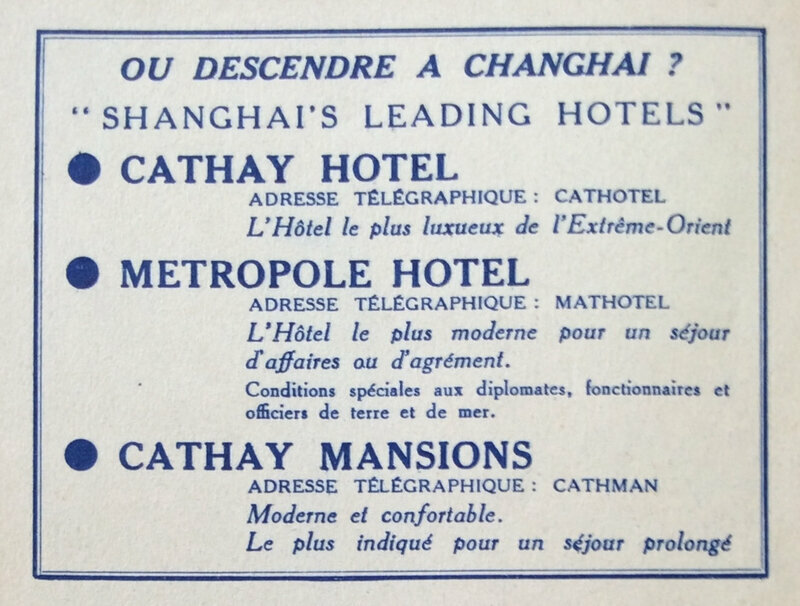 Interesting also is the advertising in French language on the back cover of the guide concerning Victor Sassoon’s properties: the Cathay Hotel, Cathay Mansions and Metropole. The smart Jewish Sephardim entrepreneur had obvious reasons to target the wealthy passengers of the Messageries to become his guests in his top end Shanghai hotels. The last but not least point of interest is the guide city map. The meticulous selection of the streets to visit do tells a lot about the concern of the French Line for safety. When one is aware of the crime rate in the late 1930s, this one recently reminded to us by Paul French’s excellent novel “City of Devils”, one realizes how creative the publicity agents of the Messageries Maritimes needed to be. 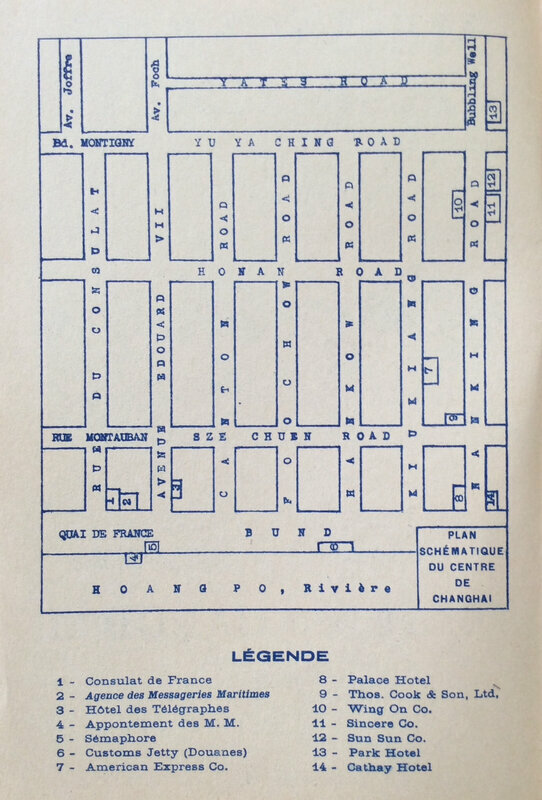 Most striking to me was indeed that the infamous “Blood Alley” (Chupaosan Road), which was located right behind the Messageries Maritimes offices on the Quai de France, has simply been scratched off the guide to make sure that no passenger would ask rickshaw to take them there. I guess nobody wanted to find one of the company custoners bathing in his own blood at early morning, stripped off his clothes and money after having spent the night with the Russian hostesses of Jack Riley's Manhattan Bar! Finding this book in Hong Kong came as a nice surprise and made the fresh memories of fascinating Shanghai come back to my mind. I suppose that one never really leaves this city! Thanks so much for articles like this and all the interest in Shanghai that you posted in social media. I was two years old in Shanghai at that time and the war changed everything forever for my family. We had spent five generations in Shanghai, more than one century! I have published a book about out century in Shanghai. It's been endorsed by professors Pan Guang and Xiu Xin and is classified history. We were interned by the Japanese during WWII, for three years with all other Allies. My book is titled “Hiding in a Cave of Trunks”. It's at several universities and I have lectured extensively, internationally, about the subject. The world should know the history of what really happened in Shanghai!